At Bank Street, children are immersed in learning experiences relevant to their lives and tailored to their developmental moment. 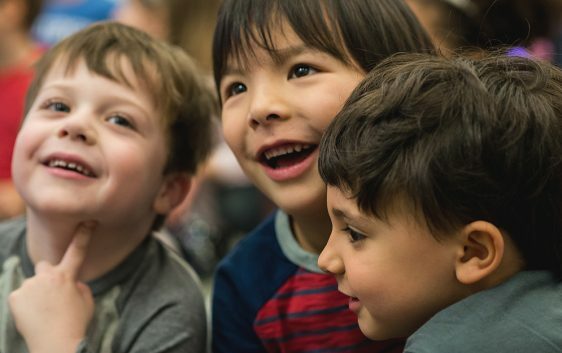 Collaborative, lively, messy—a Bank Street classroom is a place where children’s innate curiosity is nurtured and guided by masterful educators who teach children how to think, not what to think. Here, children build the social, emotional, and cognitive skills essential for success in school and in life. Bank Street–trained teachers are highly valued and sought by schools across the country. The School for Children is their model for excellence in children’s education and many choose to teach here. In fact, 65 percent of School for Children teachers have graduate degrees from Bank Street Graduate School of Education, a national leader in preparing teachers who are at the vanguard of progressive education. At Bank Street, the world is our classroom. We encourage students to discover the world around them by entering into it and engaging with it. Our educators look for teachable moments within each child’s reach and assist as they develop new understandings and ideas. Bank Street is passionately committed to building a diverse community of learners that reflects our city and world. We strive to acknowledge, support, and educate a community of children and adults to be sensitive to and respectful of diversity and put our philosophy into action through a social justice- and equity-driven curriculum across all subject areas. Bank Street’s facilities reflect our values of educating the whole child—including a science lab and a woodworking studio, a teaching kitchen, two music studios, an art studio, and a multipurpose/dance studio. Our play-based curriculum is supported by an outdoor rooftop playground, an outdoor play deck, and a regulation-size gym. Our library is recognized as an unparalleled resource for children’s literature, with 70,000 children’s books and 50,000 books to support our Graduate School of Education. Bank Street has an engaged community of more than 3,000 School for Children alumni throughout the New York metro area, across the United States, and around the world. Here’s what they say about their School for Children experience. Transcript I think the commitment to develop the whole child is really important. That it's not academic achievement but it's about, you know, developing critical thinking skills being able to work with different types of people-being a good, I guess, steward for the community. I think you develop the ability to work with people who have a diversity in thinking and style of learning, and I think that you develop the kind of emotional intelligence. I like being at Bank Street because it is learning by doing in a group. I think what Bank Street really did was shape the way I think more than anything else. It has definitely caused me to kind of look at things from a different perspective than I think I would have otherwise. I think I'm a much more flexible kind of thinker and creative thinker in terms of how I look at issues. I think I'm a lot more likely to kind of look at things from multiple perspectives now. Definitely in high school I kind of see that in comparison to the other students in the class. I think I'm kind of more confident in expressing my views by allowing people to kind of discuss their ideas so much and look at basically what they're learning. In such a kind of creative and open environment, it really helps them kind of interpret and analyze those things themselves. In a lot of the schools I dealt with, I think kids are very aware of the social power play of economics even at a young age, and I don't think we were at Bank Street. Sure, I think we're really taught to collaborate and interface and rely on the grace of interaction or find grace in interaction- not because of who's who, but just because of. I don't know, something much more guttural and natural. My friends that I graduated from Bank Street with are activists or active, so they have a feeling and they have a belief and they're active in that belief-not just good intentions, but really an ally. And an ally for us means that you are active. I think that Bank Street was very like upfront about adult issues. I remember learning about apartheid when apartheid ended in South Africa. That happened while I was here.. and in this winter concert. we sang the South African national anthem, which I didn't realize at the time how special that was. But I sang it to somebody recently and they were like, oh yeah, that was a really important time. I think that the largest part of the education was these moments where they incorporated other cultures into the education and historical events that were happening in real time. A lot of people have started their own business or they're thought leaders or they're executive directors or what-have-you. So I think about nonprofits from an early age and this idea of leadership and thought leadership because of its, you know, education philosophy, its commitment to diversity and community stewardship. I think it really develops amazing citizens, creative learners, people who have a passion to learn, who ask questions to be curious. Those are the kinds of skills you need to be successful in life, and I think Bank Street has mastered that. I think there's no other place if you want your kid to be a good citizen and be a lover of learning. Then this is a place for you. A nursery through eighth grade school is a close-knit community that provides the support children need as they experience gradual and radical shifts in their physical, emotional, social, and cognitive development. As a result, Bank Street students are known and cared for; feel safe and confident; and have the courage to explore new ideas, face challenges, and make mistakes. By eighth grade, students have acquired a high degree of self-knowledge and can take a leadership position in collaborating with parents, teachers, and administrators throughout the high school application process. My daughter started at Bank Street in 2nd grade, and coming from a public school, we were looking for a nurturing environment that encouraged learning through play. As we moved through the grades, it was heartening to see that the curriculum became more academically rigorous and prepared students for the challenges of high school.